“Just another writing assistance service…” – that’s what you might think while visiting this company’s webpage. These thoughts seem to get quite right, but we tried to dig deeper in order to present you a reliable review. All the results are below. What Services You Can Get Here? 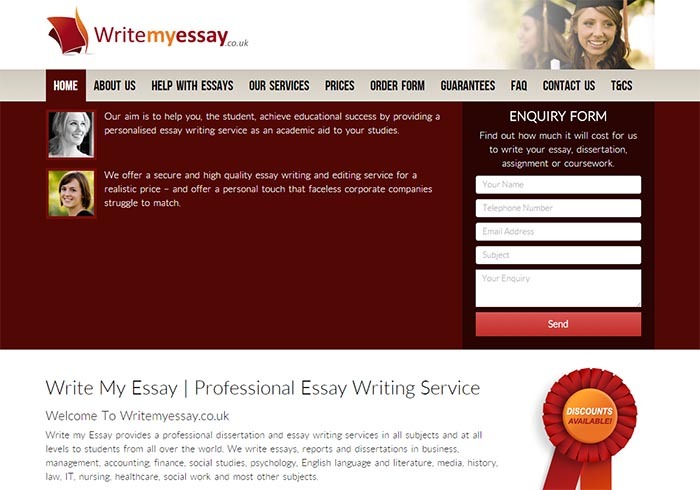 Writemyessay.co.uk offers dissertation and essay writing assistance services for students of all levels (undergraduate, master’s, PhD degrees are all here), literature reviews, researches, coursework, reports and even PowerPoint presentations for clients. The variety of subjects is almost fully covered, including business, management, finance, social work, psychology, law, nursing, history and healthcare as well. Though, the content displayed on the website seems to be written for search engines and not for users. Lots of overall descriptions and lack of precise info. But texts are not overwhelmed with spamming keywords, and this is a plus if to look at the general situation. Still, the phrase about writemyessay.co.uk to be the “best and most reliable writing and editing service in UK” might make someone doubt. Writing standards: budget charge, normal charge and double charge. It is said all works are of a proper quality. So, what’s the difference? “Prices” page doesn’t explain that, telling the user to get in contact with the company’s customer support service. Academic level of the ordered writing. All good, standard option for essay services. If to talk directly on prices offered, they’re definitely higher than average market costs. The company doesn’t position itself as the most affordable text writing service, but prices are really expensive. Students looking for the best option should know there are services offering much more affordable prices for their clients. Hope the quality of writings to actually correspond such payments. The customer can transfer money for the order through bank account, credit card, or PayPal service. Additional point for overall reliability, though not the strongest one nowadays. The service with an average reliability, not the lowest prices, not the best writing speed. That was the impression after studying the company’s website. If one wants to get more detailed info, it is better to ask the customer support managers for help. But keep in mind there is no Skype, phone or live chat option available. The only way to contact this service’s representatives is filling in the appropriate form. If you’re ready to show up your email and phone number, we hope “pros” could help you find out what you want to know. It just might be not worth it.